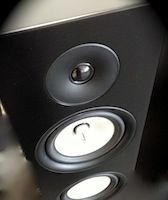 Roth reveals OLi RA speakers tuned by EB Acoustics boss; on sale September 1st | What Hi-Fi? Roth Audio has confirmed that its third-generation range of hi-fi and AV speakers, with audio design by EB Acoustics boss Richard Allen, will go on sale from September. There are two bookshelf models, a pair of floorstanders, a centre speaker and subwoofer. The Roth OLi RA models come in a matt black finish and are priced from £99 to £399. A 1in black diamond silk-dome tweeter is used throughout the range. The OLi RA1 (£99) bookshelf speaker combines the tweeter with a 4in woven fibreglass hybrid driver to create a small speaker designed for use with micro systems and budget hi-fi set-ups. Next up is the RA2 standmount speaker (above, £149) with a 5.25in driver and bigger cabinet. The RA3 floorstander (£299) uses the same silk-dome tweeter with a pair of 5.25in drivers, while the flagship RA4 uses a brace of 6.5in drivers. If you need extra bass for a home cinema system, Roth will provide the KH30 subwoofer (£249) with 200W of power. And there's a C30 centre channel speaker for just £99 (below). Details are a bit sketchy at the moment, but we've just been alerted to a new range of speakers on the way from Roth AV, with audio design by EB Acoustics boss Richard Allen. Four models will be launched in the new Oli RA range, starting at £99 per pair for the Oli RA1 and going up to £399/pr for the floorstanding Oli RA4, and there will also be a centre speaker, the C30, and the KH30 active subwoofer at £249. Due on sale late July/early August, the speakers feature voicing and acoustics by Richard Allen, and cosmetic design and manufacturing by the Roth UK team. That's all we have for now – we'll update when we have more details.